Created on Wednesday, August 02, 2006, 07:29:46 and categorized as Political. 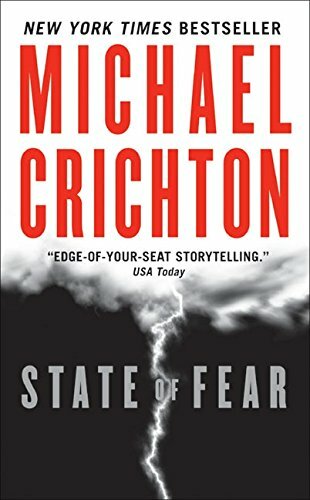 At present I am reading Michael Crichton's year 2005 thriller 'State of Fear'. The book is about global warming and whether it actually is a true threat or not. Crichton (by the way pronounced like [Cry-ton]) shows amazing background knowledge, the facts the book presents are scientifically founded by references to many external studies throughout the whole story. But what really made me think was the part where Prof. Hoffman presents his theory about the State of Fear. According to this theory, usage of words like 'crisis' and 'catastrophe' has dramatically increased since the fall of the Berlin wall in 1989. Before, both cold war parties lived in constant fear of the other party, but since only the western side had survived, politicians needed new threats and fears. One of them global warming. Woman killed by a collapsing wall of an abandoned supermarket in Daly City. Fidel Castro undergoes surgery. Exil Cubans celebrate in Florida. Lebanon under heavy attack by Israeli army. Stay tuned. Infomercials about germs (Krankheitskeime), cars and clothes. What war really looks like. A US soldier has documented straight from the battle field and is going to weave his images into a documentary. Weather forecast, another sunny day in the Bay area. What can be said by that? One thing is certain: US media are all about visuals. The second part of the news did not contain any actual news. The war images were from the Iraq war and showed heavy fire, shaking camera slides and happily waving kids. It is these 'Stay tuned' trailers that nourish the 'State of Fear' theory. I remember one trailer from the first days of the Israeli offensive in Lebanon. The camera zoomed on crying women in front of their destroyed houses while the off-voice raised the question 'Is this the beginning of World War III?'. I am not sure if I want my kids to grow up in a world like that one day. What if you just know the one side the media presents? Many Americans speak just one language, given the size of their country, more than enough, but given the role this country actually plays in the world, way too few. Be that as it may, 'State of Fear' is definitely worth reading.